This is closely related to Festuca ovina, but is easily distinguished from this and any other fescue by being viviparous. 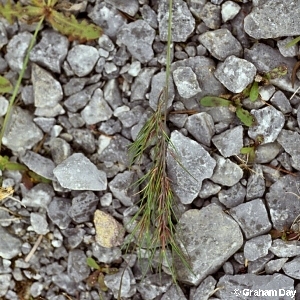 This means that small grass plants grow in place of the flowers, giving this grass a very distinctive appearance. No other species of grass in Northern Ireland normally behaves in this way (Poa alpina is somewhat similar but does not grow in Northern Ireland, being confined to Co.s Kerry and Sligo). It is frequent in upland situations in hilly districts such as the Mournes, the Antrim Hills and the Sperrins.